The Canada-European Union Comprehensive Economic and Trade Agreement(CETA), like other looming mega-treaties, is a comprehensive vehicle for expanding the scope of transnational investment by rolling back the capacity of governments to regulate in the public interest. The attack on democratic governance is not restricted to the notorious Investor-State Dispute Settlement (ISDS) mechanism, which privileges transnational capital by creating a parallel legal system exclusive to transnational investors. The invasive claims of transnational investors permeate the entire treaty. Canada and the EU are already among the world’s most open economies. Tariffs are at a historic all-time low. CETA’s primary mission is to eliminate “non-tariff barriers” – namely the laws and regulations constructed over decades of struggle to limit corporate power and support the services and policies needed to defend workers, citizens and the environment. CETA is an investment treaty embedded in a comprehensive deregulatory project. The “legally scrubbed” official CETA text states, tautologically: “Investment means every kind of asset that an investor owns or controls, directly or indirectly, that has the characteristics of an investment” (CETA, 2014: 39). Characteristics of an investment include “the expectation of gain or profit.” In addition to direct investment in an enterprise, ‘investment’ includes stocks, shares, bonds and other debt instruments; concessions, “including to search for, cultivate, extract or exploit natural resources”; intellectual property rights and “other moveable property, tangible or intangible, or immovable property and related rights,” and “claims to money or claims to performance under a contract” (CETA 2014: 39ff). A corporation need only demonstrate a “legitimate expectation” of profit to challenge regulatory obstacles to realising that expectation. The investment chapter ‘reaffirms’ governments’ rights to regulate in the public interest, but investors are guaranteed expanded “fair and equitable treatment” and protection against “indirect expropriation” of anticipated profits through the adoption of new laws and regulations. The dispute settlement body will determine whether indirect expropriation has occurred through a ‘fact-based inquiry that takes into consideration, among other factors: the extent to which the measure or series of measures interferes with distinct, reasonable investment-backed expectations’ (CETA, 2014: 331; my emphasis). Indirect or ‘regulatory expropriation’ has enabled a growing number of successful investor challenges to public interest laws, regulations and court decisions through investor-to-state lawsuits. Behind CETA, or course, lurks the Transatlantic Trade and Investment Partnership (TTIP). Should TTIP fail, many of its ambitions can be realised through CETA. The majority of U.S. transnationals have Canadian subsidiaries with activities and ‘expectations of profit or gain’ in the EU. They can use ISDS and other provisions to feed their growing appetites. 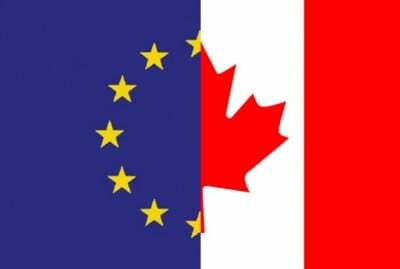 EU corporations can sue the government of Canada, but also use Canadian subsidiaries to attack European regulations they find inconvenient, reinforcing the EU’s current retreat from regulation. Peter Rossman is the Director of Campaigns and Communication for the International Union of Food, Agricultural, Hotel, Restaurant, Catering, Tobacco and Allied Workers’ Associations (IUF). This article first published by Global Labour Column.